I ran out of sugar yesterday. I decided last night that, then, that I’d replace my bag of organic, fair-trade sugar in the morning. The last one had lasted me several months, but I was down to my last half-cup. First thing this morning, I walked to the local Ten Thousand Villages – where I always get my sugar — with Lydia in the jogging stroller and picked up a bag, grabbing some fair-trade cocoa while I was there. As the lady was ringing it up, she pointed out that the price had gone up. I looked at the price tag for the first time. Six dollars! For two pounds of sugar! That was quite a jump – it had only been $4.75 the last time I’d bought it. I decided I was going to have to be even more sparing with my sugar from now on. I refuse to buy conventionally-produced sugar, which is highly processed, and, more importantly, often brought to us through highly exploitative practices. I want to be sure that the sugar my family consumes was bought at a fair price, helping small farmers earn a decent wage, and grown in a sustainable way. But at that price, I just can’t afford to use much. I already don’t use granulated sugar often. Even the organic, less-refined kind is not great for your health. More often, I use either maple syrup or honey, which at least have various vitamins, nutrients, and (in the case of raw honey) beneficial enzymes. Lately, I’ve been making a lot of sweets using only dates, and no other sweetener whatsoever. All of these sugars are expensive. Like, really, really expensive. A one-kilogram bag (2-pound) of organic, fair-trade sugar is now six dollars. A 500g (pint) jar of raw honey costs the same. The best price on maple syrup I’ve been able to find is $12 for a liter (quart). So I have to use them all very sparingly. We just cannot afford to eat much of any of them. When I use them in recipes, I try to cut back as much as possible. With granulated sugar, I usually cut the amount by quarter or half of what the recipe says. Fresh fruit is another rather expensive source of natural sugar, and unavailable (if you live where I do) for a good chunk of the year. So we’re limited to small amounts throughout the year. And that’s why I’m rather glad natural sweeteners are all so expensive: they make frequent sugar-snacking prohibitive. We can’t afford to eat a lot of sweets. It turns out, only buying natural sweeteners is good for your health because not a lot of people can afford to use them much. The high cost of natural sugars has also forced our family to be more resourceful. My parents took up bee-keeping last year, so they’ve kept us stocked with free raw honey. (We just have to help with the harvesting). And we’re religious about tapping our maple tree every year and boiling down the syrup. And when sweet fruits are plentiful in the summer, we work hard to preserve as much as we can through canning and freezing. 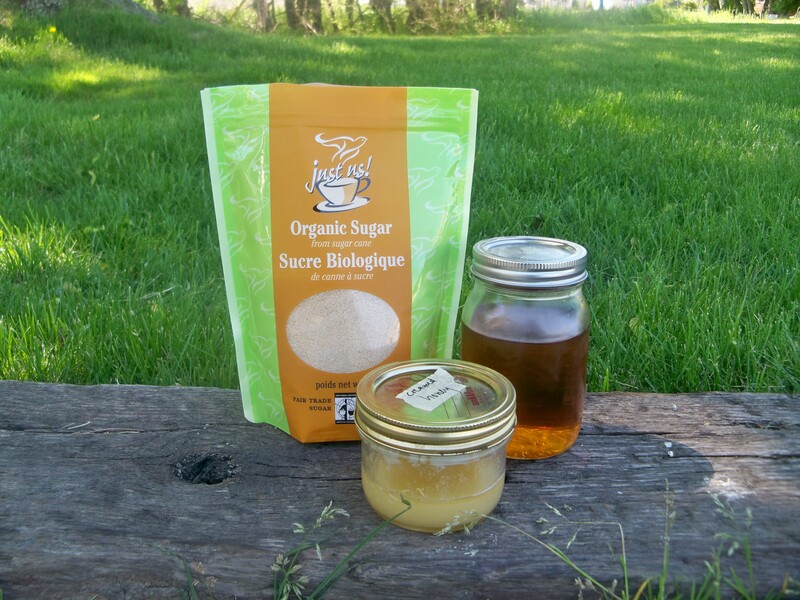 We’ve found some very economical ways to source natural sweeteners. However, these sources are limited, so we have to carefully ration it to last throughout the year. Which works out quite nicely, considering the way our bodies were designed. The reason we humans crave and love sugar so much is because we were designed to gorge on and enjoy sweet fruits just a few times a year when they’re in season. We weren’t meant to stuff our bodies with sugar every day of our lives. Sugar is a precious commodity that we are meant to enjoy only occasionally. Because the real stuff is a precious resource, it’s expensive to buy. And I’ve decided I’m okay with that. In fact, I’m glad. It puts a natural cap on how much sugar we’re able to consume. So bring on the six-dollar bags of sugar. It’ll make sweets all the more precious. This sounds noble, but similar to Fair-Trade goods (which are anything but fair), the notions that cheap goods must be a result of “highly exploitative practices”, and that buying a higher-priced alternative to coffee, chocolate, sugar, etc. help small farmers earn a decent wage, are myths. They feed our need to feel good about ourselves, to feel charitable, to feel ethical, or to feel “green” (or whatever else we equate as altruism) because at the first layer, they appear very simply to be helping. However, as most myths in economics, digging just a little deeper into these notions reveals a troubling truth quite at odds of what appears at the surface of the issue. Well organic fair trade cocoa certainly tastes WAY better than whatever this stuff is I’m eating these days. But fair trade or not if it’s actually organic I go for that if I can. But for me fair trade and or organic win over regular sweeteners and then taste and nutritional content is the final breaker. Hi Terry! Thanks for sharing this. I will definitely read the article, since this is an issue I feel strongly about and I want to know all the sides of the issue. Thanks again for the link. I’ll be mulling over this for a while. “Highly exploitative processes” indeed. Exploitative to the consumer, that is. Consumers in the US regularly pay DOUBLE what the rest of the world does for sugar. Between subsidies and import tariffs, US sugar producers have a very sweet deal with the government at the expense of taxpayers. Couple that with the fact that because sugar prices are high, companies often turn to corn syrup as a cheaper alternative. Surprise, surprise, corn is also highly subsidized by the government. Which means that we not only pay for corn and sugar growers through taxes, but we pay again through inflated prices at the final sale. Economists estimate we overpay for sweeteners to the tune of $3 billion a year. You may be happy that you can’t afford sugar anymore, but anyone with the slightest economic knowledge will tell you high prices hurt the most the people you claim you want to help — the poor. Hi Carrie! Thanks for your points. I hadn’t even thought about how corn syrup factors into everything, since I avoid it entirely. My discussion was only focused on natural/unprocessed sweeteners, like honey, maple syrup, fruit, and organic cane sugar. I was only considering how the high prices of these sugars, to a family committed to healthy eating, actually work in our favour to discourage over-consumption. You make a valid point that with higher sugar prices, companies turn to corn syrup, which is even worse for our bodies. You also make a good point that consumers are being exploited, too — particularly poor people, who, instead of responding the the high price of sugar by avoiding it, often turn to (cheaper) corn syrup. Thanks for making me think about these issues. Again, I hadn’t factored that into my post, nor the addictive nature of sugar and corn syrup. Ideally, our response to overpriced sugar would be to consume less of it. But we’re talking about a highly addictive substance here, and not everyone is aware of the effects sugar has on us. The other ideal response would be to start producing it ourselves (i.e. by keeping bees and tapping maple trees); but not everyone has the knowledge or resources to do these things. You’re right that my knowledge of economics is very limited. (And my knowledge of U.S. economics is even less, since I’m Canadian. I’m not sure what the situation is here in Canada, in regards to taxes and subsidies.) But one way I hope to help the poor is by sharing knowledge about how we can become producers rather than consumers and escape the exploitation of billion-dollar corporations. It may not be much, but it’s the best I know right now. Kathleen, I did not realize that you are Canadian! With that knowledge, my comment missed the mark a bit. Also, after re-reading it, I realized the tone was also a bit snippy. Sorry about that, and thanks for the kind reply. I enjoy learning about economics and sharing what I’ve learned with others. It really is a “soft science” like sociology, and it’s a very interesting way to predict human behavior through things like incentives and trade offs. If you’re interesting in expanding your knowledge, Thomas Sowell has a wonderful book called “Basic Economics.” While it’s quite thick, his intention was to write a book explaining economics for the everyday person. No math formulas and boring procedural stuff — just the fun results of his decades of study. Again, thanks for the nice reply. Although I was out of bounds, so to speak, by referencing the wrong country, I suspect that your being one of our northern neighbors had some influence on the kindness of your responses. Cheers! Great post! I agree, we should consume things in their natural abundance, not the very out of proportion abundance that the grocery store shelves belie. It’s such a complex issue (as the comments prove!) that sometimes my temptation is just to think, oh bother that, and carry on how I am. Because to try and figure out the economic, health, environment, political factors in something like buying sugar? And then do that for every product I consume?! Cue major headache! But the thing I always take away from your posts is the importance of being intentional, of actually thinking about your choices and trying, to the best of my knowledge and resources, to make the best choice. interesting angle! and for what its worth, the sugar/corn subsidies in the US are pretty infuriating since it just makes us put more of it in processed foods because it is so cheap….blech. anyway, i have a post request! 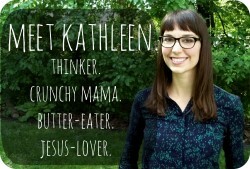 I love hearing about the different foods you make and would LOVE a “kathleen’s not-that-sweet sweets recipe” post. how does that sound? I’ll be waiting with baited breath as literally every night for the past few nights i’m just CRAVING something sweet and i could be choosing healthier options…i’m addicted! Alison! What a great idea! I’ll have to do that — I’ll try within the next week or two. Thanks so much for the suggestion!! I bought some dates yesterday, probably because of this post :) Mike thought I was crazy but I had two yesterday and they are incredibly sweet, so i’m hoping to use those to take the edge off. And no rush! I just really loved your popcorn recipes…actually just made some yesterday as well! And I’ve officially tried them all too! Yum yum.